There you have it. There’ll be those who believe that the men and women of 1916 had a vision of a 32-county Irish republic, there’ll be those who believe the same thing but consider the 1916 people deluded (cf Prof J A Murphy) and finally those (the great majority of southern politicians) who tie themselves in a contortionist’s knot trying to celebrate the birth of Irish independence while at the same time doing their damnedest to ignore the fact that six northern counties still await the dawning of their independence day. The mental knot people will sweat and strain because if they admit that Pearse and Co had in mind a 32-county republic, someone might ask them what they and their party have been doing for the last one hundred years. And they might even be faced with questions about the link between the violence of 1916 and that of our more recent northern Troubles. Stop sweating, guys. Hit the Murphy road and declare the 1916 people to be a mentally aberrant posse of self-deluders, that there’s no such concept as a 32-county republic. 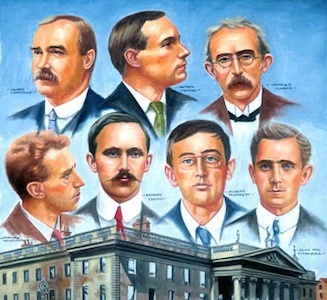 Only wait a minute...Is it OK to have a commemoration/celebration of men and women who were (i) violent and (ii) codded themselves that Ireland extends from Derry to Cork and from Newry to Galway? Oh what a tangled web we weave/When first we practice to deceive.